This is an eight-sided step cut diamond with a rectangular outline. This cutting style gets its name from a common cutting style that’s used for, you guessed it, Emeralds. Emerald gems (the green gemstone) are cut from long pencil-like rough crystals. This cutting style gives the best weight retention from the Emerald rough and when diamonds were also cut in the same style to match up with the beautiful green Emerald center stone, the Emerald Cut diamonds looked pretty good also, so it became available as a diamond shape. This shape was particularly popular during the Art Deco period. 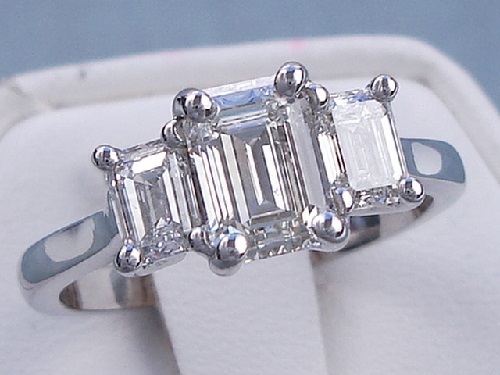 When I see Emerald Cut diamonds, I think of the old movies from the 30’s…. 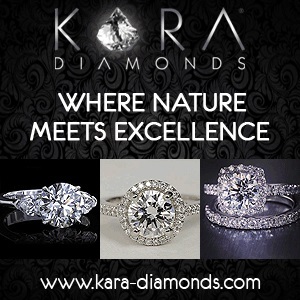 these diamonds can be very elegant. This is not a brilliant cutting style, it is a step cut style which means it has long narrow facets. With a brilliant cutting style there are many small irregular shaped facets on a curved surface around the diamond… so a round brilliant cut will be all “blingy”, and yes…. 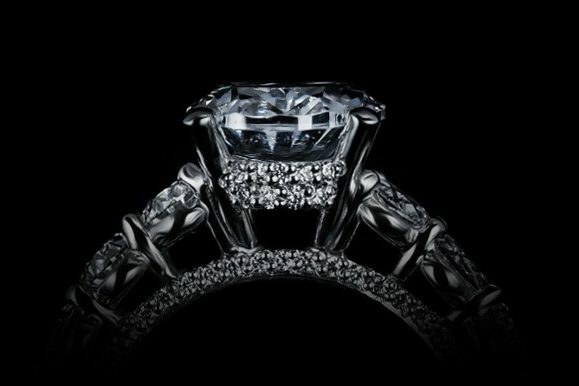 blingy is a very technical gemological term! The step cut facets on Emerald Cut Diamonds are fewer and much larger, so there are broad flashes of light as the diamond moves. look for a length-to-width ratio between 1.30 and 1.40 to 1. There are also some variations in the amount that the corners are beveled… I’ve seen some corners just barely cut and others that have been cut back quite a bit. There really isn’t an exact guideline to follow here… if the length to width along with the amount of bevel that the corners have seems to work together, then that’s all that matters. The prongs are usually placed at the cut corners so once the diamond is set it will change the look by covering the corners. #1- Because of this “step cut” style of facets, an Emerald Cut diamond with a lower Clarity or lower Color could be very obvious. A properly cut Round Brilliant Cut diamond that is really lively, “blingy”, the diamond inclusions along with the body color can be masked to an certain extent… this is not as possible with a step cut like an Emerald Cut. 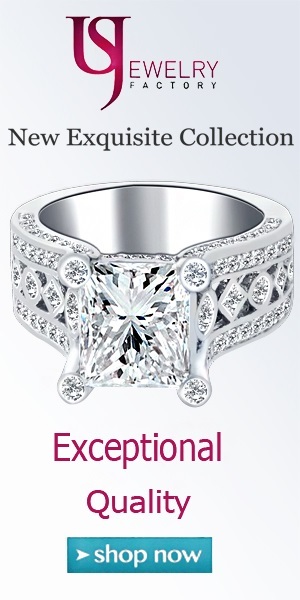 A slightly higher Diamond Clarity and Diamond Color will be a good idea when choosing am Emerald Cut diamond…. probably no lower than an “SI1” in Diamond Clarity or lower than a “I” in Diamond Color. Of course, if you look at an Emerald Cut diamond in a jewelry store and it is lower than these parameters but it still looks beautiful then you will most likely realize a savings as compared to a higher Clarity and Color…. 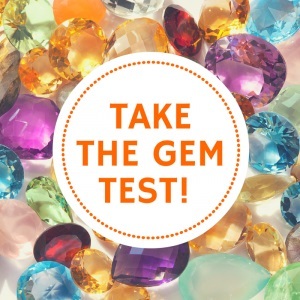 but when shopping at an online diamond retailer you really should stay with the stricter lower limits of Diamond Clarity and Diamond Color (SI1, I). #2- The range of table percentage can be from 60 to 75%, the total depth percentage from 55 to 70%. The most critical aspect will be the angles that the pavilion facets will be set to… the light should roll across the pavilion in a smooth even fashion. The cutter will really have to know what they are doing in order to make Emerald Cut diamonds look lively and not just look like a lifeless piece of glass that you can read through. Emerald Cut diamonds are usually cut from pieces of diamond rough that are kind of flat to begin with, so fashioning this shape will be the best choice giving the best weight retention from the rough. Diamond cutters that are skilled in cutting Emerald Cut diamonds will usually search out this type diamond rough to work with.